The music you are listening to was written and sequenced by Larry Holden. It has never been copyrighted and never will be. It is used with his gracious permission. We're going to park the Chevy and have a stroll around Bannack, one of the best preserved ghost towns in the United States. Got your comfortable walking shoes on? Let's go! 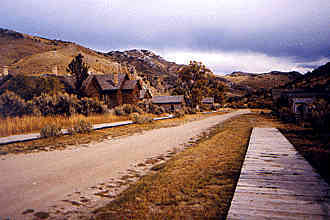 Bannack was known as the "Toughest town in the West," and was Montana's first territorial capital. 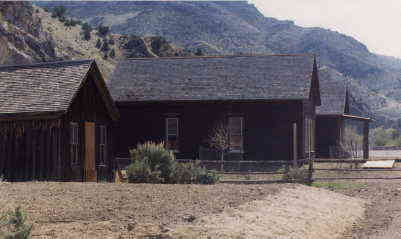 It is also the home of the first major gold strike in 1862 in Grasshopper Creek. 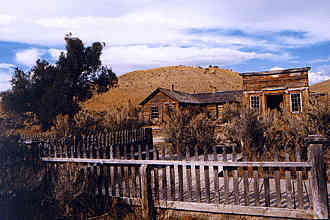 Bannack is located in Bannack State Park in southwestern Montana. It is unique in that it is not being restored, but rather preserved. 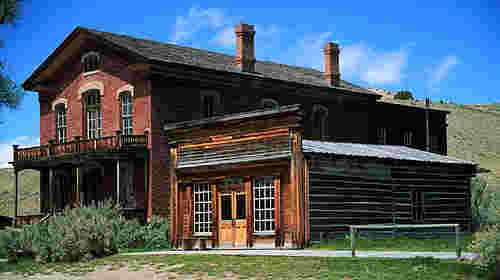 This is the Meade Hotel and Bannack Courthouse, built in 1875. 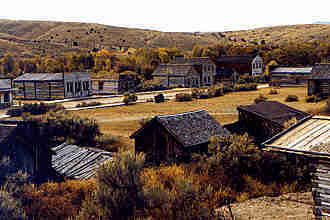 During its heydey, Bannack was terrorized by renegade Sheriff Henry Plummer. His desperadoes murdered 103 individuals and robbed countless others, but the law-abiding citizens rebelled. They formed the Vigilantes. 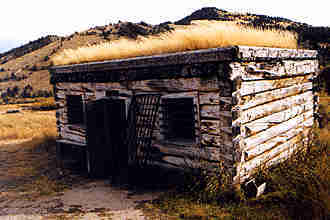 Sheriff Plummer was thrown into the Bannack jail and later hanged on one of the gallows formerly built by the outlaw sheriff. This is the first Masonic Hall chartered in Montana. 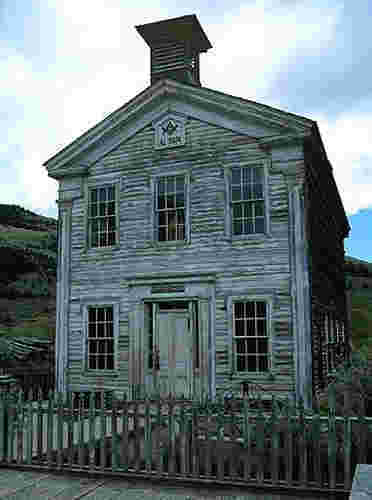 The Masons met on the second floor and the first floor contained the Bannack schoolhouse. 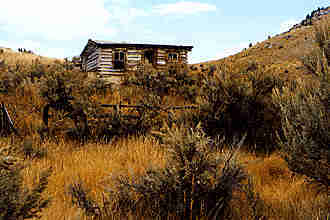 Sitting alone, perhaps this house was considered to be in the "suburbs" of Bannack. This is Bachelor's Row. Most miners camped beside their claims on Grasshopper Creek. However, when weather turned cold, they built a row of permanent shelters. Anyone need to use this luxurious two-seater with built-in air conditioning? No? OK, let's continue our tour of Bannack. 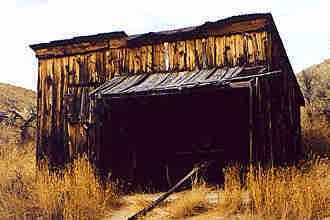 A wagon that has seen its last use rests silently within its shelter. 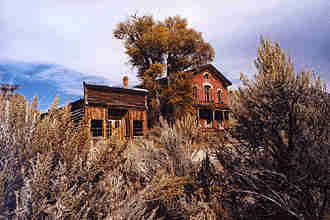 Almost 100 buildings remain intact in Bannack, including this old homestead. 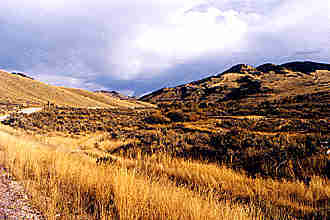 New gold strikes began to lure away the population of over 3,000. It's reputation lives on, however, in Western history. 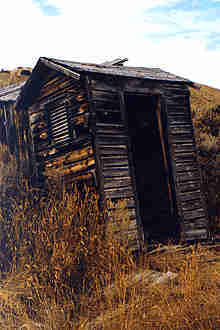 Renois Cabin dates back to the 1860's. It was built by Zavier Renois, a French Canadian. 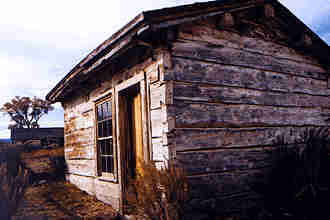 It is one of the oldest buildings in Bannack. 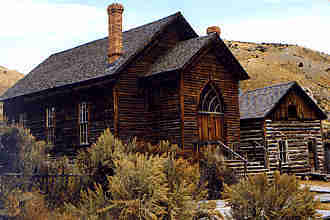 The Methodist Church was built in 1877 under the direction of Methodist missionary William Van Orsdel. 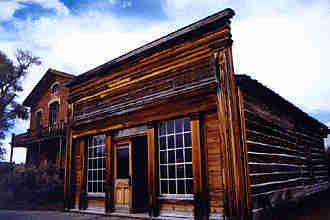 Skinner's Saloon was a popular gathering place for miners. This was one of the first of such places and was built and operated by Cyrus Skinner. 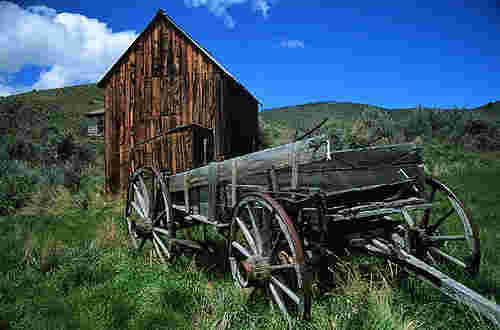 I wonder how far across country these old wagons rolled? 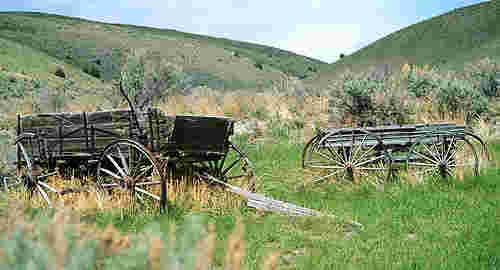 Resting peacefully in the green hills of Montana, these wagons stand in mute testimony to the rich, and often violent, beginnings of Bannack. Wow! What a place. Wasn't that fascinating? Ready to go see some more of Montana? Let's pile in the Chevy, buckle up, and we're off to parts unknown.